Got in very late last night, from a weekend back in Liverpool. And this morning, when I dragged myself downstairs, what did my tired little eyes see in the fridge, but an absence of milk. No museli for breakfast then. And more importantly, what, no tea? Drama. Then what did I spy lurking in the depths of the back of the fridge? A milk jug, with enough milk in for a large, strong cuppa. And for breakfast? The cake tin helped me out with a forgotten end of a banana bread. 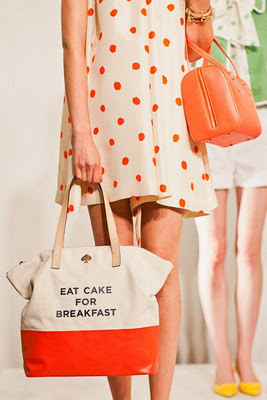 Cake and a cuppa for breakfast - great way to start the week, and I'm in good company, if this bag and t-shirt from Kate Spade are anything to go by.